Alright, guy. We got it. You're big. We're all impressed that you were born so big. Way to be born. It doesn't change the fact that you're a mouth breather. 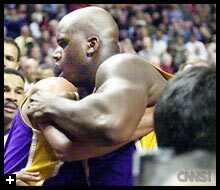 Stop flailing around trying to throw punches because you're mad you're not getting your way. When you go home and sleep on your big pile of money, everything will be OK. I promise. And by the way, you're not a rapper, so knock it off. Same goes for the acting career. Stallone Zone - Lots of great info about the man who requested that you stop before his mom shoots you. Log on to join in the search for his missing career. Thank God I finally went over to Pocaroba's house and got some videos to put up here. I apologize for the conspicuously unobscure nature of the entries of the last couple weeks. So here we are. 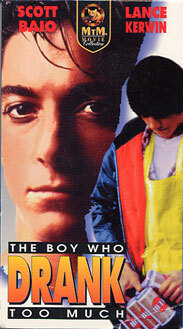 It's The Boy Who Drank Too Much starring Scott "Charles in Charge" Baio. It's our feeling that this was a made for TV movie, because we haven't been able to find much info on it in our trusty video books. From the back: "Buff's uncontrollable obsession with alcohol causes him to lose his friends, his job, and threatens his life." Substitute "Baio"for "Buff" and "crappy roles" for "alcohol" and you've got a pretty accurate film. Wow. When I first saw this, I assumed that it was old. Like mid-80's old. And it's not. It is, however, one of the funniest things I've ever heard. 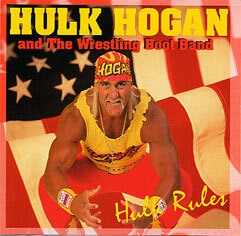 Hulk himself plays bass on the record and even does some rapping on the track "Hulkster's Back." Other notable tracks include "Hulkster's in the House" and "Hulkster in Heaven," a sentimental ballad in which Hulk mourns the loss of a sick child in the UK who was a devoted Hulkamaniac. I never knew the Hulkster was such a softy. Also includes Jimmy "Mouth of the South" Hart on percussion and backing vocals. Whatcha gonna do when the crappiest record ever comes after you? LBST - Stands for long in back and short on top, when referring to an individual's hair style. Pronounced "el-bee-ess-tee" or "libist." Origin- ONUG has been saying it since at least 1991. Check the very first Sly Records release I Think Cheyenne's Friend Hates Me for a group called All Beef Patty (Youth In Asia) performing a song called LBST. See also- mullet, ape drape, socker rocker, business in the front party in the back, neck warmer, SFLB (shfelby). Usage- "Dude, did you see that guy in the shiny blue low riding Honda Accord?" "Yeah. Dude, that guy had a flaming LBST." 10. "I'll have a Cutty on the rocks and the lady will have a peach wine cooler. Charge it to Sly Records." 09. "Sure, I'd love to have breakfast with you. But before we go, who are you and where am I?" 08. "Yes, I do have a lot of records. Please don't touch them. In fact, could you move away from them all together? Thanks." 07. "Am I drunk? Well, I guess that depends on what you consider drunk. Yes, I have had 14 tall boys of Miller High Life. But, I'm a pretty big guy. Do the math." 06. "I stand corrected. Ringler's is actually a really cool bar. Can we go to Chopsticks now?" 05. "You know, after listening to their CD for the last four days in your car, I have to admit: The Dixie Chicks are actually very talented. Can you take me home now?" 04. "It's not liquor, it's liqueur. There's a big difference. It's a lot classier. Drink up." 03. "Will I hook your friend up with Oatmeal? Sure, but I must warn you: He's pasty, white and lumpy, just like any good Oatmeal should be." 02. "My favorite song? 'Love is a Battlefield' by Pat Benetar. How about you?" 01. "C'mon, how many Karaoke DJ's do you think there are in town? You're hangin' with royalty!"